Mister Rogers arrives with a collection of maps that will be shared later by Astronaut Al Worden. While he waits for Mr. Worden's return, he goes to the kitchen to boil some water at the request of his astronaut friend. .
Just as Mister Rogers starts to sing I Like To Take My Time, Mr. Worden arrives with more to share. Among other items used on his space flight, Mr. Worden shows a variety of space food and explains that the food is prepared by adding water. They add hot water to one package of food to make a helping of spaghetti and cold water to another for a serving of orange drink. After they enjoy the space food, Mr. Worden uses the maps to talk about the back side of the moon that is never seen from Earth. Mr. McFeely arrives to take Mr. Worden to the airport. In the Neighborhood of Make-Believe, King Friday presents a gift to Astronaut Worden -- a model of the solar system. At the furthest point on the model is a small image of King Friday to represent the Neighborhood of Make-Believe -- an invitation to Astronaut Worden to return often. Everyone gathered at the castle expresses their admiration for Astronaut Worden by singing I'm Proud of You. Lady Elaine Fairchilde arrives with a flag that reads F.F.J. -- Flying For Jupiter. She explains that the astornauts can "take care of that little moon business" while she plans to fly to Jupiter. Back at the house, Mister Rogers shows a picture of George Allen who once taught him to fly a small airplane. He shows a film of Mr. Allen teaching others to fly a similar plane. As mentioned by Mister Rogers in the previous episode, Al Worden had been staying with the Rogers family. Upon his arrival on thsi episode, Mister Rogers easily expains why Mr. Worden is not with him: "Al Worden will be here in just a little while. He was packing his bag when I left my real home to come to my television home to be with you. Yeah, but I wanted to be on time for you." The Neighborhood of Make-Believe models are still on the table from the previous episode: "Oh, look here. I left these like this yesterday. I think that's the first time I ever did that." When Mr. Worden leaves, Mister Rogers says goodbye to his friend and wishes his "best to Florence." Although it would be easy to assume Florence is Mr. Worden's wife, according to his biography, Mr. Worden was unmarried at the time of this episode's taping and has never been married to anyone named Florence. Mr. Worden leaves the television house without the eating utensils he used in space. Mister Rogers suggests, "I can send them to him. He has to make his airplane." "When I was three, this young man was just an early teenager and his mother had died. And my mom and dad said, 'Come live with us.' He turned out to be a real model for me. As a matter of fact, when I was in high school, he taught me how to fly. And right after that he went to teach at Tuskegee Institute in Alabama and taught all the black fliers in the country to fly in the second World War. His name was George Allen...and I really admire him." 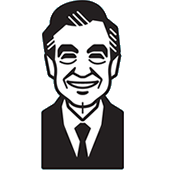 The Wonder of It All: Fred Rogers and the Story of an Icon. Margaret Mary Kimmel PhD and Mark Collins. 2008.